In order to achieve an eye-catching look, you really have to learn how make your lips stand out. One simple way is to go for bold lipstick. While bright shades can definitely change your appearance, the margin for error is less. You will spoil your look if you do not know how to apply lipstick flawlessly. It is natural to think that applying lipstick is no tricky task, but flawless application requires you to keep a few important things in mind. Keep reading to learn some tips about applying lipstick in a perfect way. It is true that most women already know how to apply lipstick, but doing it keep the following steps in mind will really help achieve a perfect look. Start by exfoliating your lips. This will help create a smooth canvas and make it easier for you to achieve a stylish look. Use a lip mask to help keep your lips moist. You can even use a super moisturizing lip balm for this purpose. Be sure to leave it on your lips for as long as possible. You can continue doing the rest of your makeup giving your lips time to absorb as much lip balm as possible. Now, remove the balm and ensure that your lips are dry. Use translucent setting powder before going any further. This powder really helps keep your lipstick in place. Take a skin-toned lip pencil and use it to line your lips. Take your lipstick and apply it first on the cupids bow area. Then, move to the bottom and outer corners of the lip. You should then fill in the rest of the lips. Now, apply HD powder to your lips with the help of a small brush – you can use your ring finger as well. Apply some lipstick again. Once done, take a concealer and apply it on any areas that need cleaning up. A q-tip will work just fine too. 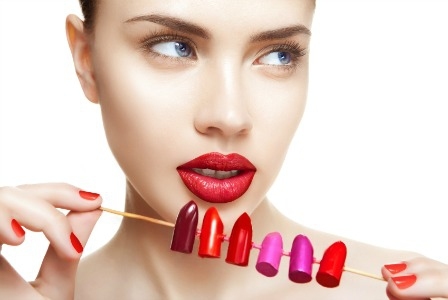 Try two different shades of lipstick if you want your lips to appear plumper. For this, you should first apply your usual lipstick and then apply a relatively lighter shade down the center of your bottom and upper lip. Blend well. Make use of lip liner to make your lips pop. You need to create an outline of about 0.6 cm using lip-liner around your lips and then fill in the area with your lipstick. Apply a coat of clear lipstick in the end. Use blush carefully. You can make your lipstick look matte by using the blush in a similar color. You simply need to apply your lip liner and lipstick the usual way and then finish the process by sweeping your finger across the blush and apply it on your lips. Be sure to press your finger against your lips to apply blush. Avoid using shimmery blush because it does not work with all lipstick colors. Pick a right lip liner color to create ombre lips. You should select a lip liner color that is a shade darker than the color of your lipstick. Use this lip liner to create an outline first and apply your lipstick. Using a lighter shade of lipstick will help you get a more impressive ombre effect. Apply a clear gloss in the end to blend things well. Select a lighter lip liner for a reverse ombre effect. You have to apply your lipstick in the usual way but create an outline using a lighter lip liner. Alternatively, simply use a lipstick in the darker shade than your lip liner for a reverse ombre. Create rosebud lips. If you want to know how to apply lipstick in a way to get rosebud lips from the flapper era, you should simply start by outlining the middle of your lips and leave the corners. Use a bright red lipstick to fill in the outline. Finish it with a finger wave hairstyle. Create a gothic look with ease. All you have to do is choose a dark lip shade such as dark red, black, or maroon. Get a lip liner in the matching color and apply it first. Then, use your lipstick to fill within the outline. Now you know how to apply lipstick to achieve a different look, but it is equally important to learn how to select the right color of lipstick. For instance, you can always choose to wear red lipstick if you know how to select the right undertones. If you are a pink-skinned girl, you will look great in cherry red lipstick. Opt for a fire engine red lipstick if you have olive skin. Deep reds work great for girls with dark skin. If you have fair skin, you may want to opt for lipstick shades such as nudes in an apricot shade, light corals, and pinks. Do not wear browns though. You can go a bit darker if you have a medium skin tone. You will look perfect in mauves, roses, and berries. Do not wear bright reds though. For dark or black skin, the best lipstick shades are chocolate, deep plum, and red. While selecting the right color, you should pay attention to your eye makeup as well. Never wear dark lipstick if you are also wearing heavy eye makeup. To wear red lipstick, make sure to lighten the rest of your makeup.